Built to assist with the complex problems of the dynamic bunker refueling environment. This ensures that the vessel is always refueled with inventory to the point that it can complete its intended or possible planned commercial requirements. Special check lists of constraints (vessel/port/commercial and supply-based) have been built by and factored into the module by industry experts. 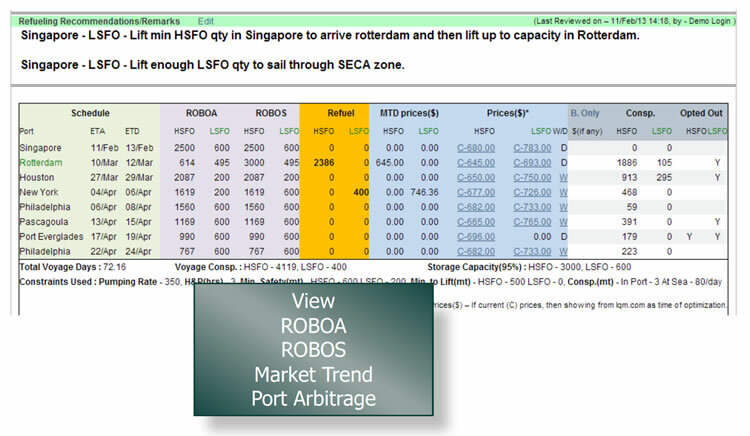 It analyzes all key variables and constraints and reports via an output screen and report the best combination of market price, port and quantity options in minutes. Reports on best fill and burn flow sequence from tank setup to assist Chief Engineer to minimize quality risk in commingling. It identifies various commercial constraints applied during a voyage or year and their specific cost impact on budget. Assists in future strategy. Ensures proactive refueling planning in environment of change in market (price/supply, quality, regulations) and matched to dynamic vessel schedule. Ensures that port arbitrage is optimized by taking into consideration the lowest priced port and planned maximum ullage made available and lifted. If commingling allowed: Ensures Chief Engineer and Master can calculate minimum risk of contamination by optimized tank fill and burn from sequence. If commingling not allowed: Assists Chief Engineer in planning tank fill and usage to increase ullage available to refueling in lowest priced port. Discover ClearLynx Optimization & Planning. Intuitive and easy to use. Increases Efficiencies And Productivity. Security designed for every step of the buying process. Built by industry leaders for your immediate deployment. ClearLynx was founded in 2014 by a team who have consistently pioneered software for the bunker industry for decades. The company's current suite of products spans bunker procurement, pricing and analytics, business intelligence, optimization and planning, 2020 compliance and data feeds. As an independent neutral transactional platform, ClearLynx are charting a new course in fuel management systems, bringing efficiencies to improved operational processes, enhanced visibility to support real-time business critical decision making and cost reductions through increased productivity. ClearLynx is a leading-edge, online neutral platform for the bunker fuel market. All rights reserved. Various trademarks held by their respective owners. Thanks for your inquiry. One of our team members will be in touch very soon to discuss further with you. Start using ClearLynx right now. Sign up for your free 7-day trial. You are agree to our terms and that you have read our policy.